December 2, 2018 Robert W.
Trade show pop up banners are in high demand during the conventions and trade show season that runs from December to April in Las Vegas. Millions of people flock to Las Vegas during this time period for the numerous events and shows. The Consumer Electronic Show ( CES ) is just one example of a huge conventions coming into town bringing thousands of vendors and hundreds of thousands of people who attend the big electronics show at the Las Vegas Convention Center. The vendors that display their wares at these shows require many signs and banners to display to help market their products. Trade show pop up banners are one of the favorite graphics that vendors like to use these important events that come only once a year. There popularity is partly because of their price ( the most popular size banner stand is priced at less than one hundred dollars) and partly because they are so easy to set up and the fact that they can be placed independently of everything because they are stand alone. Trade show pop up banners can be placed anywhere in their booths and can also be placed next to each other so as to form a much larger image. 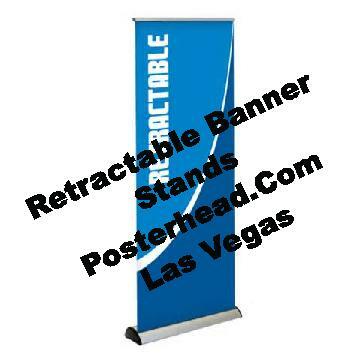 ( Vendors will take a large graphic and cut it up onto 3 pop up banner stands and then place the stands next to each other so as to simulate a one piece graphic) By doing so they make a large graphic easy to set up by themselves without the assistance of expensive union labor or help which can be very costly in Las Vegas. Trade show pop up banners are very inexpensive and can range from under one hundred dollars to under two hundred dollars for the very large deluxe model banner stands that they use to impress clients.